While it may not be the most romantic chat, have a conversation about the housework with your other half, preferably long before baby arrives. Make sure they don't assume your being at home all day with baby will mean you do everything. If needs be, make a list of jobs or apportion responsibilities, then everyone hopefully knows where they stand. 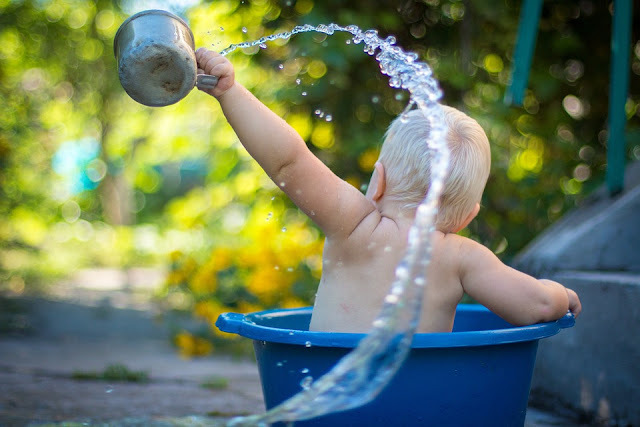 Use eco-friendly products so that you know your baby, and the planet, won't be harmed. Even better find out about making your own products using lemon, rosemary and tea tree oils. You could also invest in a steam cleaner which does so many jobs in one and uses just water to clean. The best thing you can buy for your baby is a decent sling or carrier. Find your local sling meet and try a few out, or at least get some advice. A soft wrap sling is great for newborns. 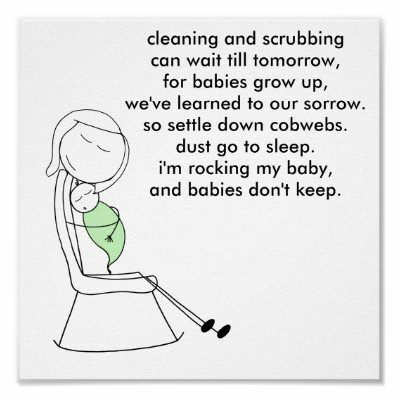 With baby happy and comfy in the sling, you can get on with some chores. Sweep, hoover and mop floors at the end of the day so you don't have to do it repeatedly. 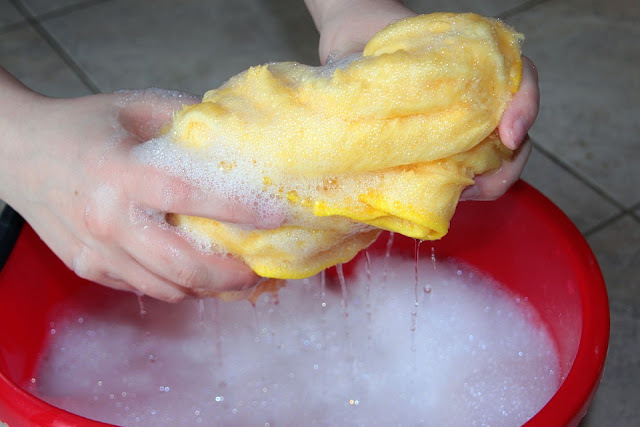 Cut up old towels for cloths and have some in each room for dusting, mopping up spills, or using damp for cleaning. We use a box or basket in each room to toss anything out of place in, then put it all way at the end of the day. We also use open baskets and boxes for toys which makes it easier for older siblings to put toys and books away. A quick 10 minute tidy a couple of times a day (use your baskets), ten minutes in the kitchen, and ten in the bathroom is ample for a quick spruce up. Keep an eye on your 'Hot Spots', those places where clutter gathers, and blitz one each day. Save the deep clean stuff for when someone else is around, once a week is fine. When visitors ask if there is anything they can do, smile confidently and say yes. Then send them to the pile of dishes/laundry basket/vacuum cleaner. Most people really are glad to help. Rope older kids in too, they love to copy you so give them a small bowl of water and a cloth to wash the floor, or pop an old sock on their hand and get them dusting. If you are really worried, and you can afford it, hire help. From a full deep clean to a couple of hours twice a week, or just a laundry or ironing service, there are plenty of individuals and companies out there more than willing to help. Don't feel guilty, you deserve it. Whatever you do, don't get hung up on housework. 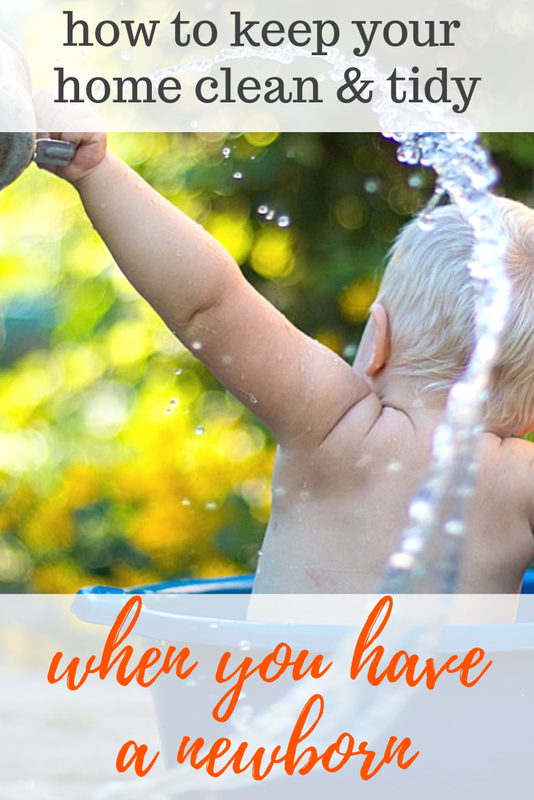 The most important thing you can do right now is bond with your baby, the rest can wait. Great advice, like giving each other responsibilities and the use of a sling etc. 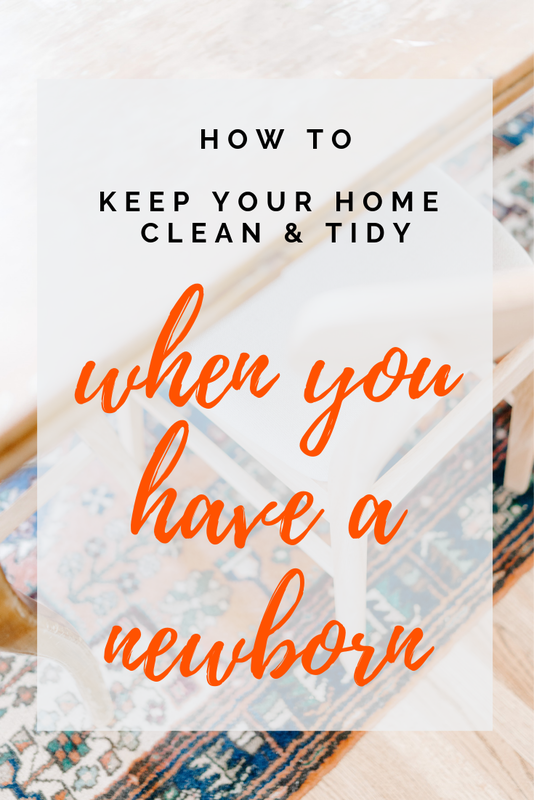 Great advice my mum did the cleaning after my first and my partner did everything after my second but I carried on as normal after my third and the only thing I couldn't do was vacuum.